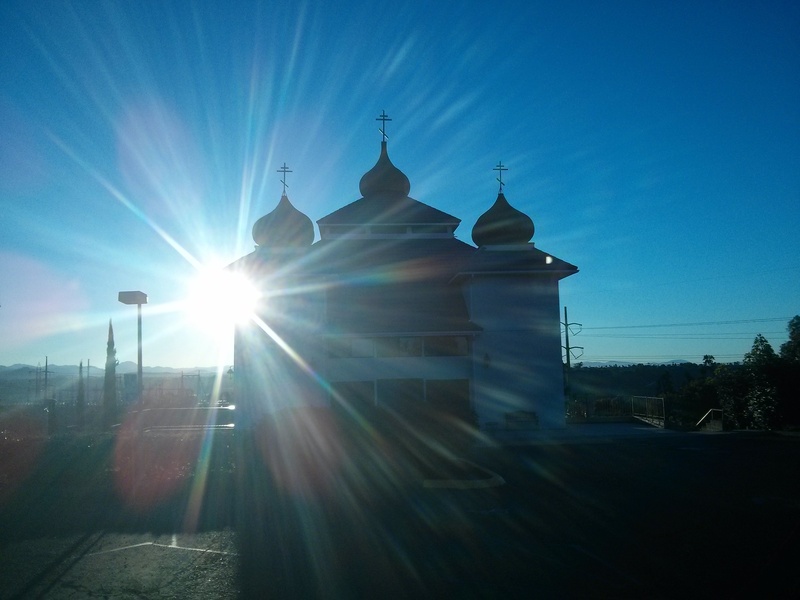 This view of my home parish’s temple spoke to me this morning, it was one of those times where I’m thankful for modern camera/cell phone technology. While not perfectly facing the East, the temple has the general orientation of facing the East, which has been traditionally the model for Church architecture. The quote below from the writings of St. John of Damascus explains why this is the case. Chapter XII.—Concerning Worship towards the East. It is not without reason or by chance that we worship towards the East. But seeing that we are composed of a visible and an invisible nature, that is to say, of a nature partly of spirit and partly of sense, we render also a twofold worship to the Creator; just as we sing both with our spirit and our bodily lips, and are baptized with both water and Spirit, and are united with the Lord in a twofold manner, being sharers in the mysteries and in the grace of the Spirit. Since, therefore, God is spiritual light, and Christ is called in the Scriptures Sun of Righteousness and Dayspring, the East is the direction that must be assigned to His worship. For everything good must be assigned to Him from Whom every good thing arises. Indeed the divine David also says, Sing unto God, ye kingdoms of the earth: O sing praises unto the Lord: to Him that rideth upon the Heavens of heavens towards the East. Moreover the Scripture also says, And God planted a garden eastward in Eden; and there He put the man whom He had formed: and when he had transgressed His command He expelled him and made him to dwell over against the delights of Paradise, which clearly is the West. So, then, we worship God seeking and striving after our old fatherland. Moreover the tent of Moses had its veil and mercy seat towards the East. Also the tribe of Judah as the most precious pitched their camp on the East. Also in the celebrated temple of Solomon the Gate of the Lord was placed eastward. Moreover Christ, when He hung on the Cross, had His face turned towards the West, and so we worship, striving after Him. And when He was received again into Heaven He was borne towards the East, and thus His apostles worship Him, and thus He will come again in the way in which they beheld Him going towards Heaven; as the Lord Himself said,As the lightning cometh out of the East and shineth even unto the West, so also shall the coming of the Son of Man be. So, then, in expectation of His coming we worship towards the East. But this tradition of the apostles is unwritten. For much that has been handed down to us by tradition is unwritten. Holy Father John of Damascus, pray to God for us!